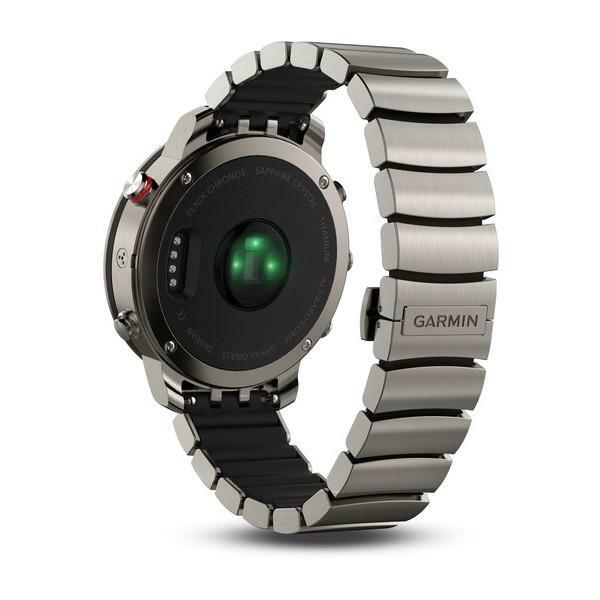 Garmin provides form and function with this very powerful and stylish, does it all fitness tracker-based smartwatch. It's very expensive, but you get what you pay for. We won’t lie, we didn’t like the Fenix Chronos when we first tried it on. Despite the snug fit, pressing the function buttons at the side kept pulling hair out of our arm and we kept forgetting which button did what – watches with their buttons is the one area we expect to have to read the manual to work out what’s going on. On top of that the low-contrast screen seemed hard to look at and we wondered how long it would be before we could stop wearing it. Boy were we wrong. 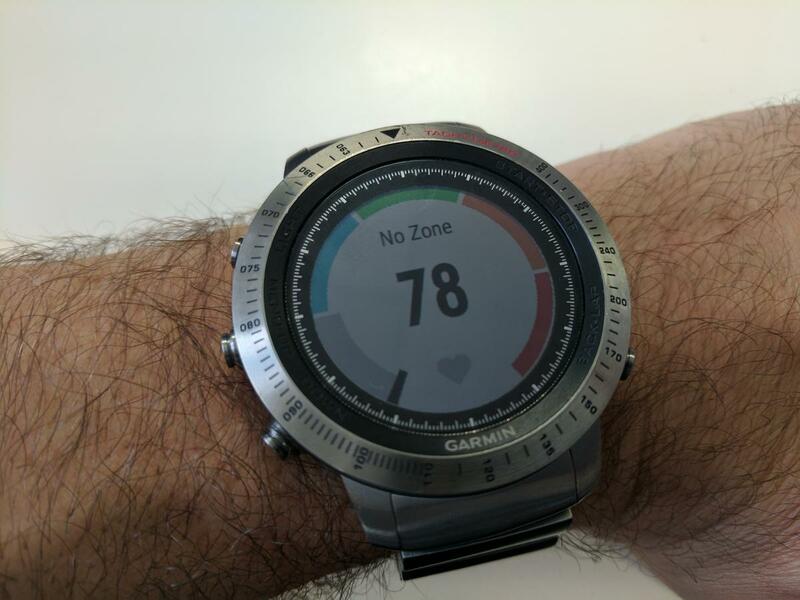 The Fenix Chronos is Garmin’s top-end, luxury, fitness-tracking smartwatch designed for corporate types who take their business as seriously as their workouts. It’s available in steel with a steel strap (186g), titanium (112g) plus steel with a leather band (94g). All have the same 30mm display while the watch itself measures a masculine 49mm. The Titanium variant (left) costs $2000, The steel/leather variant is $1399 (middle) while the steel/steel model is $1499. A hairy-looking hand can prove painful when pressing the buttons, but we quickly learned how to avoid folicular-plucking when changing functions. Our review model was the top-end titanium model which sported a link wristband where the links were held together with a toughened rubber on the inside. This meant that it would securely stay in one place on your wrist without strangling your circulation, limiting wrist movement or looking cheap. The rippled-design of the rubber meant that it didn’t make our wrist sweat and cause irritation as with other sports bands. It’s a very good design and means that the heart-rate monitor at the base was consistently able to produce accurate readings, even under heavy motion. The green heart-rate monitor can be seen at the back along with four charging pins and the interior rubber band that sits inside the band's links. Indeed without looking at the screen the whole watch does look like it belongs in the c-suite. The five buttons turn out to be useful and intuitive. The top left is always the light. The two below it are up and down, on the top right is select and below that is back. Too easy. The (sapphire crystal) scratch-resistant screen itself is a low rent-looking LCD. But the contrast is enough to still easily see it in bright light and a quick press of the light button illuminates everything very well. There’s no touch screen but we didn't miss it. Touchscreens can go badly wrong in sweaty/rainy/damp/swimming pool environments so having big buttons on the side actually proved more useful. The number of features, sensors and monitors that are built in is mind boggling and they are used to measure, well, everything. There’s GPS, compass, accelerometer, barometer, altimeter and a heart-rate monitor. These record everything from steps taken to tracking a route of a run or a hike, swimming strokes, stairs climbed and descended, golf rounds and your sleep. When Bluetooth paired with the Garmin Connect app on the smartphone, it will also display basic notifications alarms and the weather. The heat-rate screen shows different zones including, warm-up, cardiovascular and intense. It's a shame it also doesn't show the time though. The notifications are basic and there’s not much potential to interact with them – this is no Apple Watch and there isn’t an app store to add games and other features. 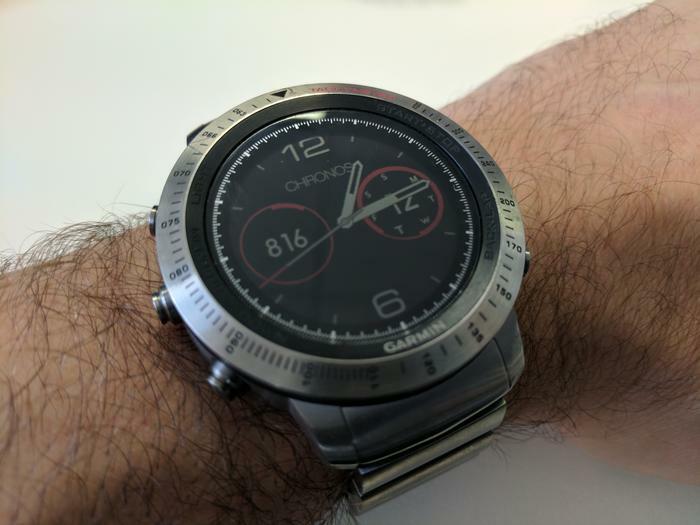 But this is where the Fenix Chronos also proves attractive – there’s still no killer app for the Apple Watch whereas Garmin’s device knows exactly what it is and who it's for… it does fitness better than anything else, it has a few useful notifications and it looks good too. Compare this to Android-based Smart Watches: we still don’t see a reason to buy those. There’s vibration alert and the ability to Find My Phone. Full specs can be viewed here. This is the killer feature. Usually smartwatches need to be charged every day – two if you’re lucky. This puts them in a very-high maintenance bracket that gets very old very fast. The Fenix Chronos lasts for a full week – a bit less if you’re constantly using the GPS, but it’s solidly about a week which includes constant, accurate heart rate monitoring. This means that sleep can be constantly tracked and all measurements, including heart rate, run 24/7. The hassle level for charging is completely nullified and enhanced further by the watch taking less than an hour to fully charge. The charging clip is one of the best methods we’ve used and you can watch the charged-percentage points go up quickly – knowing it will take a good while for them to come back down again. As such there’s no problem taking it off and charging when you’re at your desk for a while (you only need to remember once a week) and if you have let it run low before a half-marathon, it won’t take long to be ready again. Garmin rates battery life during activity at 25-hours in ‘Ultratrac’ mode and 13 hours when full GPS tracking. Ultimately, this feature sets it above most other smartwatches and is the one that made us keep coming back to it.